I have been experimenting with bagels, and here are the most recent batch. This is a version of Robotchef's recipe posted in Dan Lepard's forum, but tweaked, and made sourdough. The taste is far superior using all leaven. This makes a dozen bagels. Mix, and do a couple of short kneads at 10 minute intervals. Leave to rise for 3-4 hours. Divide into 100g portions, preshape into balls. or roll into long 'ropes', wind over your hand and seal the join by rubbing the ends of the rope together. Just reading this post Im definately giving it a go, I must confess Ive had bagels a couple of times and they were tough as nails, I thought maybe thats how theyre meant to be (?) Personal preference; we can adjust the recipe to be a tad lighter/wetter, yes? I have been tempted to make Bialys, but not yet tried - will do soon. TP I have these bagels toasted with vegemite, but they probably don't have vegemite in your part of the world. Eat them with whatever you would normally accompany your breakfast. Dom, we're practically neighbours with Oz. There are one or two places which sell Vegemite here, but I got mine from our trip in March last year...still good coz it's kept in the fridge. Yay! Thanks, Maedi. Looks like my little black hairy friend wants some too.BTW, what's the difference between hitting the 'Reply' key and the 'Add Comment' from the first post? They're actually both very different. 'Add comment' replies to the first post whereas 'reply' is directed to an individual post. Have a look at 'Threaded list - expanded' under 'Comment viewing options' located at the bottom of this page. I'm hoping to instead have a 'Post Reply' button at the bottom of a thread and taking away the 'reply' links. Viewing the Expanded Threaded List, I see most of us haven't been using it 'correctly'...except that those of us who use the Flat Expanded as default won't know that. Ignorance is bliss....or are we contributing to chaos?Apologies for hijacking the thread, Dom. Oh, there's not too much chaos. I'm going to make a 'Reply' button at the top and bottom of every topic page so we wont have that problem in threaded view anymore, but threaded view won't be threaded, it's all about compromise, unless people prefer threaded view? I personally prefer the standard view and just quoting a particular post if need be. I prefer the standard view too. Shh....let's keep it this way. Okay, I think I'll post a picture posting tutorial in the forum. ....rub that sleep off your eyes, and post the whole thing here. Don't tease. Jeremy, you used the same recipe? Lovely! I notice that you and Dom use the method of rolling the dough,then sticking the ends together to form a circle....the unskilled like me can only poke holes in a bun.Edit: LOL, looks like Dom and I are on the same vein....posting at the same time. me too! Although I am not sure if I want to introduce them into the bakery. The guys would kill me! Edit: Thanks Maedi - have figured out this photo thing now ! You can upload your photos in the Gallery, then paste them into posts by clicking the 'Add Image' button located on the editor when posting. Into this you paste the images URL which is shown in the gallery as 'Image URL'. Woohoo, looks like it worked ! Thanks ! Hmm....malt syrup may take some hunting in my neck of the woods. I wonder if you could get creative with Horlicks powder ? Just a thought. It's been ages since I've had Horlicks, so I can't remember if it's just malt powder, or a combination of other ingredients as well. By the way, glad to have another female presence around! If you can't find malt syrup, you might get away with using golden syrup - it worked pretty well before I found the malt. Gosh. Hubby's teochew, I'm hakka/cantonese. Right-o. I've got golden syrup. Cream cheese and smoked salmon for me, but they're pretty good plain as well. You're feeding an army???? Lucky them. Worse, teenager boys. They eat like there's no tomorrow. My eldest took THREE bagels to school today, filled with ricotta and smoked salmon; ham, cheese and salad and so forth. I fill the freezer once a week and hope for the best. Plus it's fun to experiment. Sourdough hot cross buns next week ! Mmmm, these look good, am getting the starter out of the fridge, fancy some of these for lunch tomorrow. 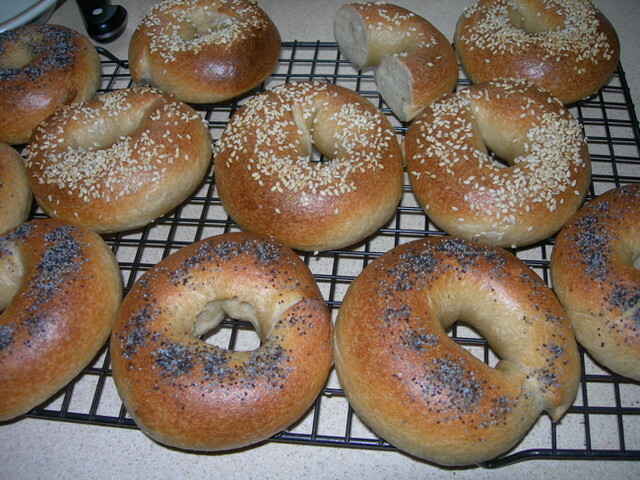 How do you get the sesame and poppy seeds to stay on, the bagels look like they have an egg wash on top. Hello Cookie, after you take the bagels out of the boiling water just toss them onto a cookie sheet coated in whatever you would like on your bagels. The bagels will be thick with seeds, etc. Otherwise, if you want less seeds just sprinkle the desired amount onto the damp bagel. Then right into your hot oven. It works like a charm. Cookie, mine have an eggwash on them - 1 egg beaten with 1 Tbsp water. I find it helps the toppings stick, although nothing seems to make caraway seeds stay on ! I've just got my first ever sourdough bagels, or bagels for that matter, out of the oven. They lost a bit of shape in the transition from the proving tray to the simmering water, but I got better at that after a few tries. They did not rise quite as well as those seen on the forum, but they did rise, are light and so tasty. Have never liked the bagels I have bought before, but these have lovely flavour. Will have to go away and work out how to put photos on this forum. Think I have to load my photo into Flickr or my blog somewhere. Thanks guys. Celia, I will certainly dust the tray while my bagels are inflating next time, good idea. I place the bagels on Tesco's baking parchment, great stuff. But I just bought a silicon sheet...will use that in future. These bagels look delicious, I'd love to give them a try, but I'm stuck at the beginning. How do I get 400gr of starter? Do I just take a tablespoon of my starter from the fridge and add 200gr flour and 200gr water? Yep, those bagels are truly delicious! When was the last time you fed your starter? If it were longer than 2 weeks in the fridge, I'd go for 2 refreshments, say, 2 times 100g flour + 100g water. Otherwise, yes, you can just add a tablespoon to 200g flour and 200g water for a 100% hydration starter. I normally make more than is required so that I have extra to keep in the fridge for future bakes.